We take great pride and fun in our Black Friday and Cyber Monday deals, but we realize not everyone can make time on those specific days to catch our amazing deals. 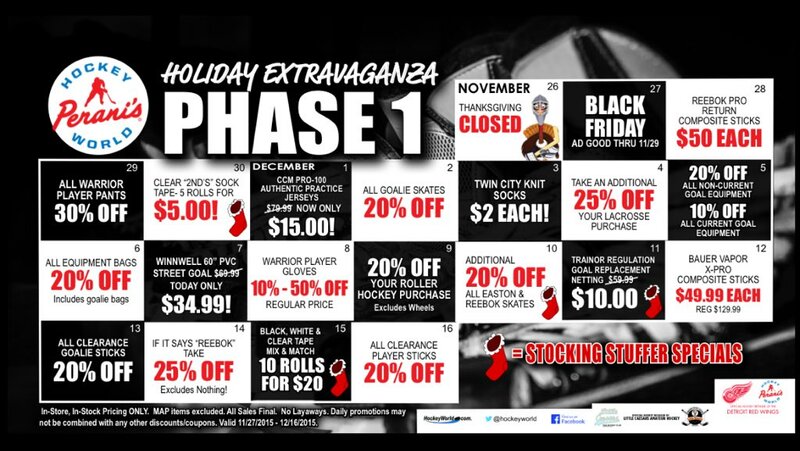 With that in mind, we’ve created an entire month of deals for the month of December to help you save more on the best brands in hockey and lacrosse equipment. Talk about some amazing holiday shopping deals, right? There is at least one amazing deal a day; we just listed a few of our favorites and biggest discounts to make sure you’re paying attention. Remember, these deals are good for in-store and in stock pricing only. Keep up to date with all of our deals and specials by LIKING us on Facebook.